Please Note: Some checks that are shown are notes or warnings. 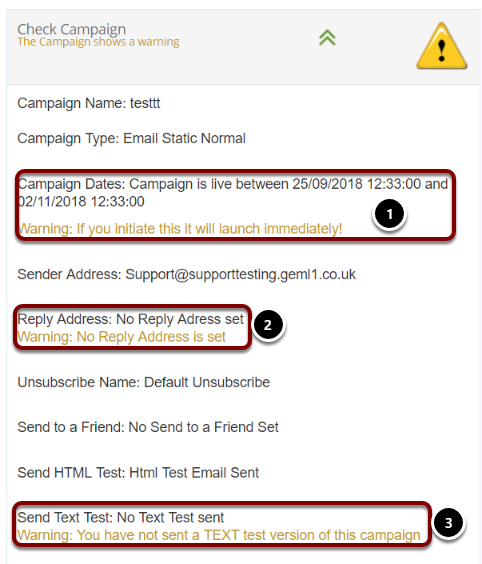 You will still be able to send your campaign even if these warnings appear. However, some are 'stop' errors, and must be resolved before the campaign can be initiated. This indicates the campaign name. This is the campaign type. This indicates how long the campaign is live for. This states the initial start and end date of the campaign. The unsubscribe that is attached to the campaign. This indicates whether a send to a friend is attached to the campaign. This states whether a HTML test email has been sent. This states whether a TEXT test email has been sent. This shows whether an Inbox Checker has been run. This shows whether any follow-ups are attached to the campaign. This is the second set of checks that you will need to review when checking your landing zones. This is the third set of checks that you will need to review. When creating tracked links within your creative email design, you have the ability to track these links within Google Analytics using UTM values. This section indicates whether your links are Google Analytics enabled. GatorLeads is CommuniGator’s website tracking software which allows you to track who is on your website and what content they are looking at in real time. 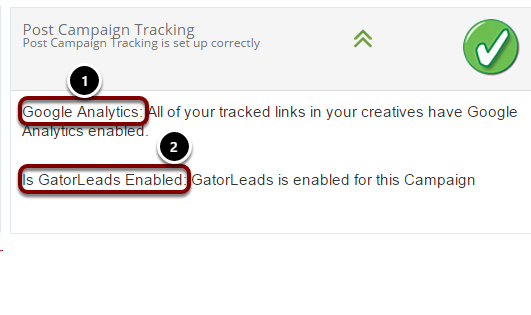 This section shows whether GatorLeads is enabled for your campaign. This is the fourth set of checks that you will need to review. The audience in a campaign determines who will receive the email. 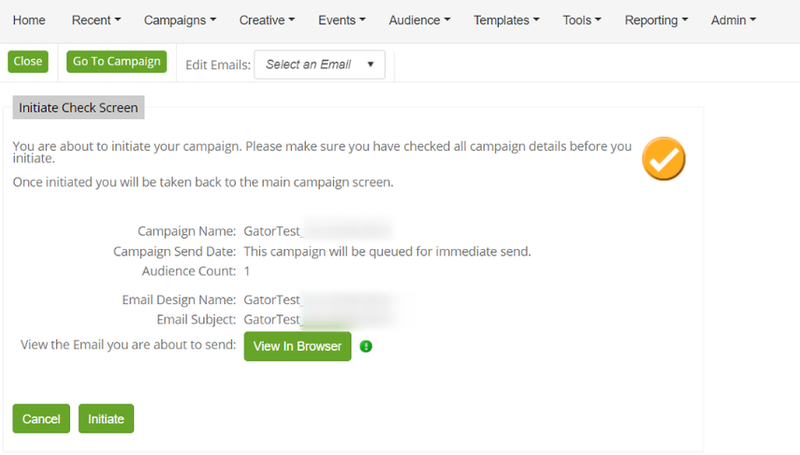 This check screen will identify which gator group you have attached to the campaign and how many contacts are included in the group. Please Note: You also have the ability to recount the audience to make sure that the contact count is correct. We would recommend this as a quick check to make sure the right group is attached. This indicates the creative email name. This shows the subject line attached to the campaign. This indicates whether a HTML email has been created. This indicates whether a TEXT email has been created. This shows whether an unsubscribe link has been included in the HTML version of the email. This shows whether a survey link has been included in the HTML version of the email. This indicates whether a send to a friend link is included in the HTML version of the email. 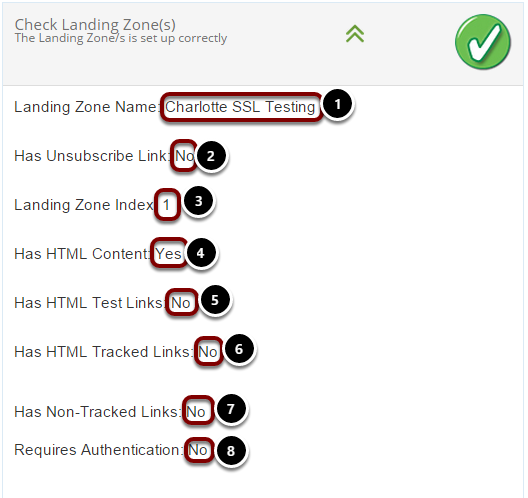 This indicates whether you have HTML test links included in your email. 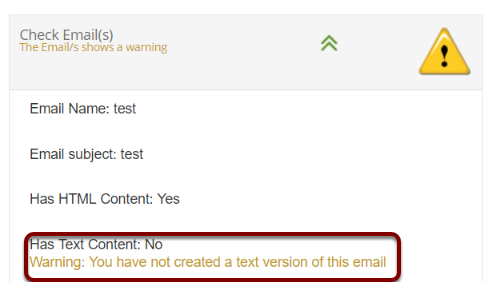 (This can occur when a user copies the email/link from a test email back into the creative email design. The only way to remove these are by locating the creative email, removing the links, and re-inserting them using the Insert Web Link Icon). This identifies whether you have included Tracked links within your creative email design. 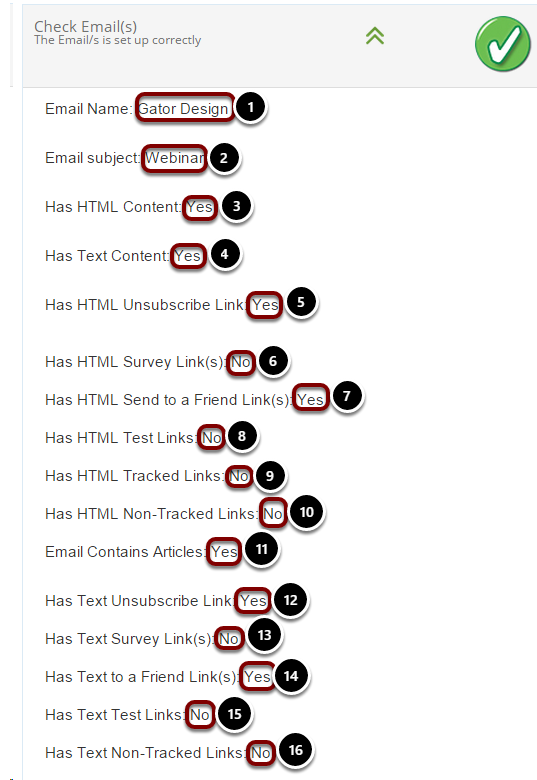 This shows whether you have Non-Tracked links included in your HTML creative email design. (Non-Tracked links will not appear in the campaign results). This identifies whether your HTML email contains articles. This identifies if your text email has an unsubscribe link. This identifies if your text email has a survey link. This identifies if your text email has a send to a friend link. This identifies if your text email has test links. This identifies if your text email has non-tracked links. If you are happy with the results of the previous checks, then you are ready to initiate the campaign. This gives you the option to go ahead and initiate the campaign, or to revert back to the campaign details. If you don't want to initiate your campaign but wish to leave comments, select the third radio button and click on 'Leave Comments'. 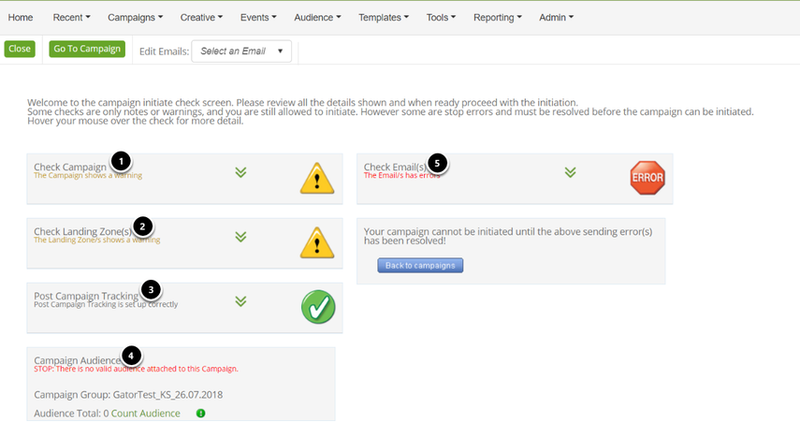 The Initiate Check Screen is the final warning before you send out your campaign. 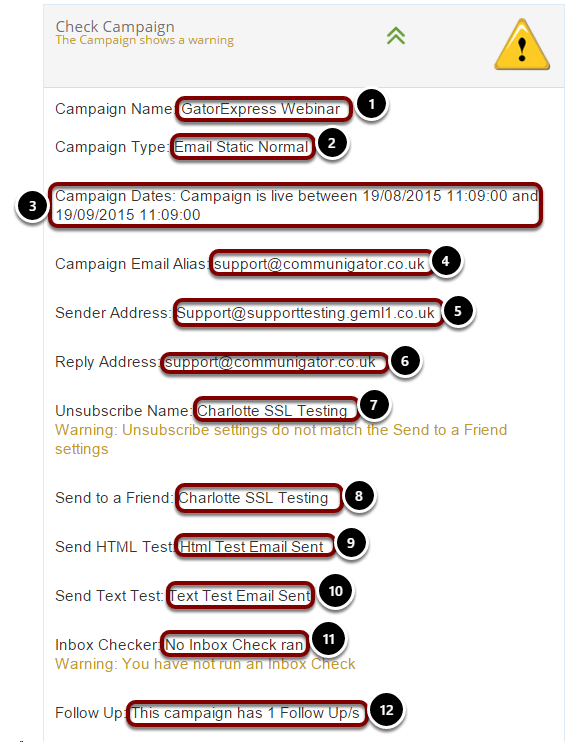 It allows you to see the key details of your campaign before sending, ensuring you are happy with your campaign. Once you have decided your campaign is complete, select the 'Initiate' button. If you get this error then your audience is not attached or there are no audience members it can send the campaign to. It will say under 'Audience Total' how many valid members it can send to. Check if your audience has a large number of undeliverables and whether there are many duplicates. For any email you create we highly recommend you have a HTML & Text Version. This is because some email clients will block HTML emails according to user settings, so having a Text email prevents them from receiving nothing at all. 1. This appears if your campaign time and date is set to send immediately. If you do not want it to send straight away place the send time and/or date for the future. 2. In order to receive emails from your customers replying to a campaign, you ideally should have a reply address set. 3. If you have a text email then you need to do a send test to ensure it looks how you envisioned it. Not testing it may mean incorrect content is sent out.